Given the maximum power rating, the presence of a low input to accompany the high level input may come as a surprise. But if you use high-output pickups or intend to use the Traveller 5 as a low-volume pedal platform, it all makes perfect sense. 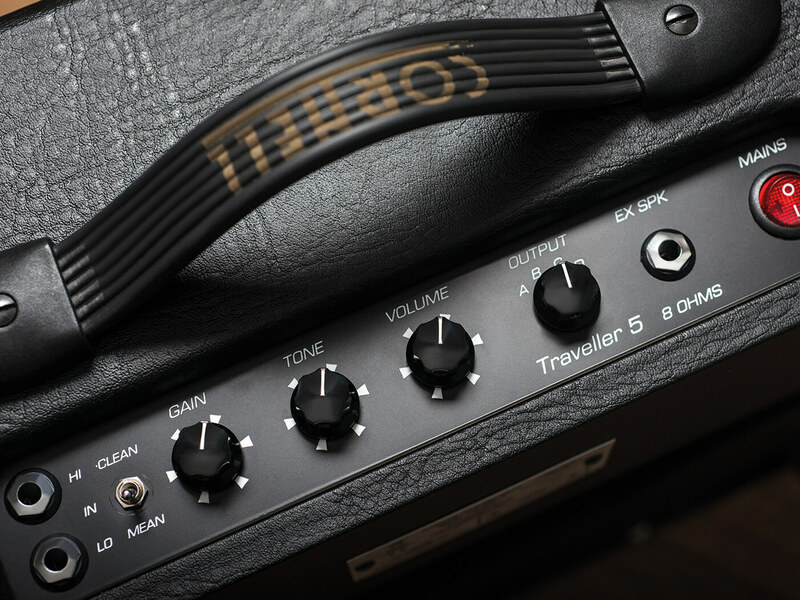 Most low-power guitar amps tend to be short on features, but this isn’t the case with the Traveller 5. Here, we have a Clean/Mean switch to adjust clean headroom, along with a gain control and a master volume. With just a single tone control, there’s not much scope for frequency-response sculpting, but the easy-to-access 8-ohm external speaker socket on the control panel makes it easy to audition a variety of cabinets. The basket-weave speaker cloth and wide framing of the robust plywood cabinet make the Traveller 5 look not dissimilar to a scaled down mid-1960s Marshall combo. Everything feels very solid and the finish quality impresses. A more stylish handle and cooler control knobs might give the amp more of a boutique vibe, even if the pricing is firmly in the ‘affordable’ camp. Although the back panel covers almost the entire rear surface area, there’s a sizeable cutout with a perforated metal grille to protect the valves. In this instance, that’s a 12AX7/ECC83 and an EL84 operating in single-ended mode. There’s also a corner cutout, which provides a convenient storage solution for the mains cable. This means that it just about qualifies as an open-back cabinet. The build quality is equally impressive inside. All the components are mounted onto an eyelet board that’s made from an epoxy-bonded fibreglass that will never absorb moisture. Clearly, Denis Cornell knows a thing or two about component layouts and everything appears to be arranged to keep signal-path length as short as possible. The high input is both louder and brighter than the low input, so for general playing duties, we find it the best-sounding and most useful. Beginning in clean mode with the volume control maxed out, a regular Stratocaster pushes the Traveller 5 into overdrive once the gain control reaches about 11 o’clock. 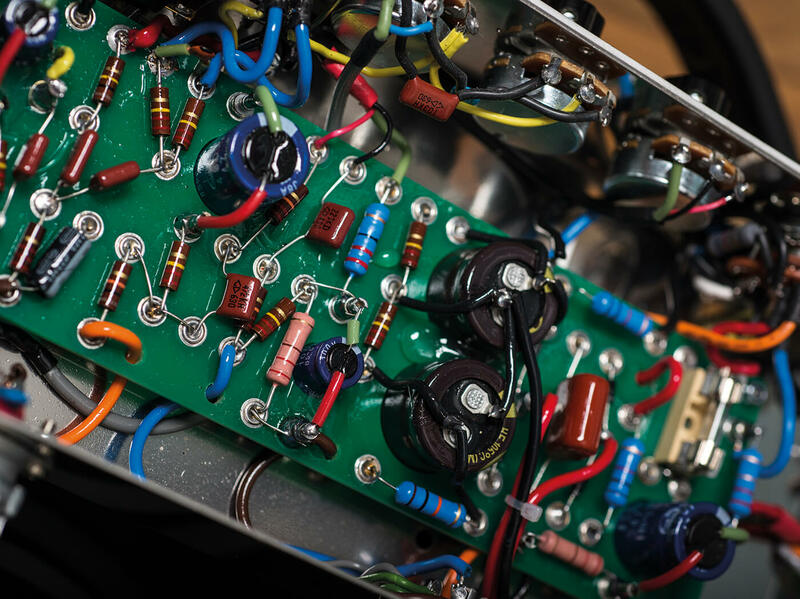 The overdrive first manifests as a growl in the low mids and then progresses upwards in the frequency range to fatten the mids, at the cost of some treble sparkle. It’s a pleasingly rough-edged tone that holds together nicely until the gain control reaches around 3 o’clock, but beyond that, things get a touch fizzy and grainy. This improves when the volume control is backed off and we quickly discover that the overdrive texture and amount of compression can be altered by balancing the volume and gain controls. Of course, you can exert even more control using the attenuation switch, but we notice that there’s an increase in distortion with the attenuation engaged. Switching to Mean mode, we hear a fatter midrange and as expected, breakup occurs much earlier. It’s a raunchier tone, with a more British bark and there’s a fair amount of saturation if you need it. Things start to go a bit awry at very high gain settings, but once again, the problem is too much volume rather than too much gain. As before, we notice extra distortion when attenuation is applied – and not of the toneful variety. 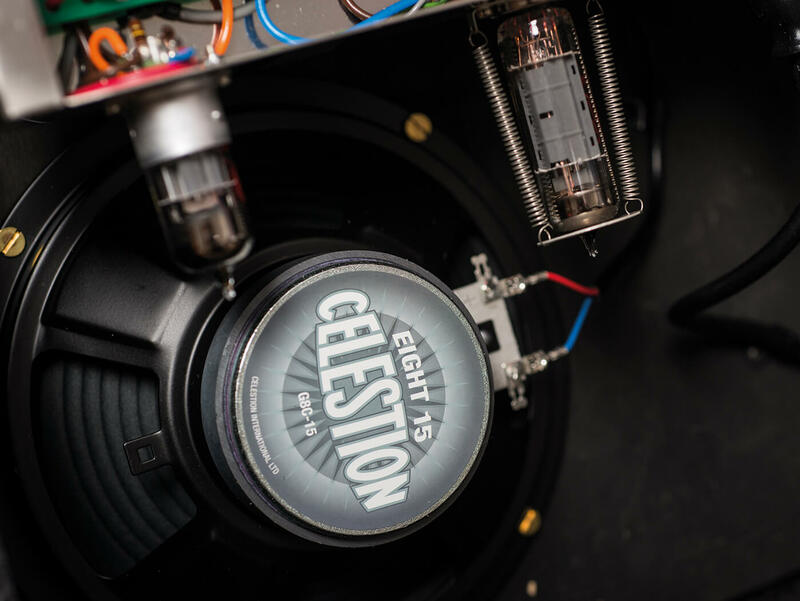 Because plugging into an external speaker disengages the internal speaker, we are able to gauge how the default Celestion G8C-15 affects the Traveller 5’s tone. Although it has all been fairly positive up to now, hearing the Traveller 5 through a physically larger speaker really lifts the proverbial lid. In short, it turns out that this is a much better amp than we hitherto thought. 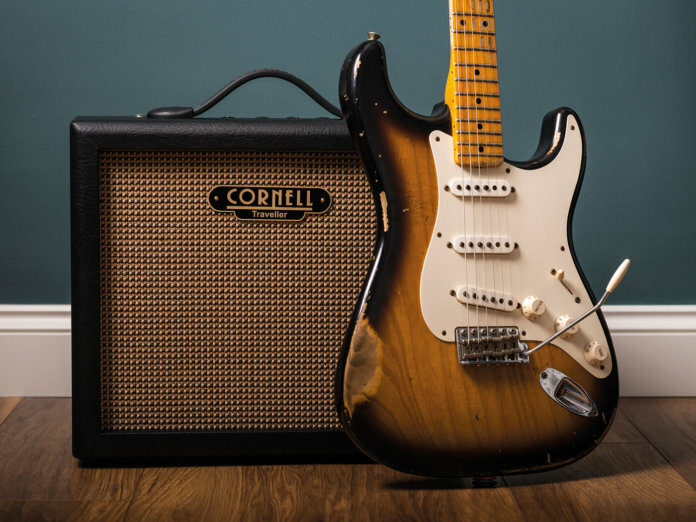 Throughout the tests, we’ve been slightly frustrated by a low-mid boxiness and lack of treble sparkle. There’s actually nothing wrong with this circuit, because the missing frequencies have been there all along, it’s just that you can’t really hear them through the stock speaker. It actually sounds pretty wonderful through a Celestion Blue, especially in Clean mode. The Clean/Mean switch’s influence on the midrange becomes more apparent in a UK/US sort of way, and without the G8C-15’s boxy colouration, the effectiveness of the tone control becomes more apparent. Our only reservation about the Traveller 5 is Cornell’s choice of speaker. Given the amount of space inside the cabinet, we feel an onboard 10-inch speaker would help this amp to realise its full potential, and we’d be interested to see it in head form as well as a combo. Having said that, in its current format, studio-quality tones are certainly available and it’s a fantastic practice and jamming-at-home amp. But with a handful of minor upgrades, it could be so much better. A well-made, great-sounding amp, but the onboard speaker hides its true character.